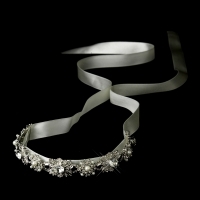 This piece is a gorgeous alternative to a bridal tiara and is a very popular and fashionable choice amongst today's brides! 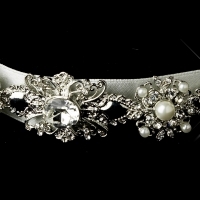 Elegant ivory ribbon effortlessly streams across your hair and ties behind your head and features a luxurious antique silver plated adornment encrusted with glittering clear crystals and luminous ivory faux pearls. Add some alluring glamour to your chic bridal hairstyle with this extraordinary piece that will coordinate perfectly with your ivory wedding gown!